The Bermuda Triangle is an area of ocean between Bermuda, San Juan, Puerto Rico and Miami, Florida. 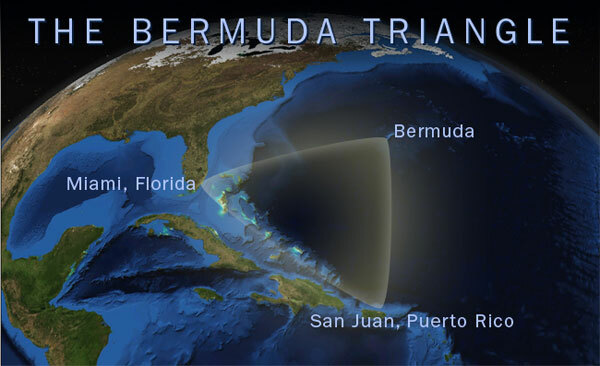 The Cubbarros Triad may not exist, but the idea for it sprang from the legend of the Bermuda Triangle, also known as the “Devil’s Triangle.” Centered between Bermuda, Miami, Florida, and San Juan, Puerto Rico, the Bermuda Triangle has long been associated with mysterious disappearances of ships and airplanes. There are stories of strange lights and bizarre clouds, and wacky readings on navigation instruments in the triangle. Well, there are those who believe, and those who don’t. As far as we can tell, every well-respected government agency and scientific organization says “no, it doesn’t exist.” They cite the fact that ships have been lost at sea since humans began traveling on the water. In fact, shipping accidents are common. Discovery Science lists what they call the top ten theories about the Bermuda Triangle.